Reutter Porzellan has released this fabulous teaset as a Limited Edition of 1000 pieces Worldwide. The 4 place setting tea service shows delightful images from the Peter Rabbit & The Tale of Benjamin Bunny. The tea service is presented beautifully in its own carry case and includes a numbered certificate inside. 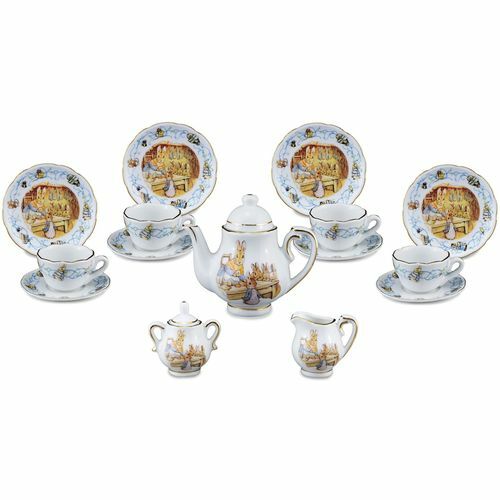 With gold rimmed and fluted edges, this pretty porcelain tea set is a smaller scale to the large picnic hamper. The set comprises of: four plates, four cups and saucers tea pot cream jug two handled sugar bowl with lid four teaspoons. The case has a curved front, a metal fastening and leather effect carrying handle. The lid contains pouches and loops to secure the plates and spoons A moulded black velour effect base displays the teapot, cups, saucers, jug and sugar bowl.